Grab yourself a big bowl of popcorn and snuggle under this marvelous afghan while you watch Hawaii Five-0 re-runs! Rnd 1: Starting at center, ch 10. Join with sl st to form ring. Ch 3; in ring make 4 dc, ch 3 and (5 dc, ch 3) 3 times. Join to top of ch-3. Rnd 2: Ch 4, (dc in next dc, ch l) 3 times; * dc in next dc, ch 3, in next sp make (dc, ch 3 dc) ch 3, (dc in next dc, ch l) 4 times. Repeat from * around , ending with dc, ch 3 and dc in last sp, ch 3, Join to 3rd ch of ch-4. Rnd 4: Sl st in next sp, ch 3, complete a popcorn st, * (ch 2, popcorn st in next sp) twice; ch 3, dc in next 3 dc; in corner sp make (dc, ch 3 and dc); dc in next 3 dc, ch 3, popcorn st in next sp between popcorn sts. Repeat from * around. Join to first popcorn st.
Rnd 5: Sl st in next sp, ch 3, complete pop­corn st, ch 2, popcorn st in next sp,* ch 3, dc in next sp, dc in 4 dc; in corner sp make (dc, ch 3 and dc); dc in 4 dc, dc in sp, ch 3, popcorn st in next sp, ch 2, popcorn st in next sp. Repeat from * around. Join. Rnd 6: Sl st in next sp, ch 3, complete pop­corn st, * ch 3, dc in next sp, dc in 6 dc; in corner sp make (dc, ch 3, dc) dc in 6 dc; dc in sp, ch 3, pop­corn st in sp between popcorn sts. Repeat from * around. Join. Rnd 7: Ch 3, * 3 dc in next sp, dc in 8 dc; in corner make (3 dc, ch 3 and 3 dc); dc in 8 dc, 3 dc in sp, dc in popcorn st. Repeat from * around; join to top of ch-3. Break off and fasten. Finishing: Sew 7 rows of 5 motifs together. Attach yarn to any corner space. Rnd 1: Ch 3, in same sp make 2 dc, ch 3 and 3 dc; dc in each dc around making (3 dc, ch 3, 3 dc )in each corner sp. Join. Rnd 2: Ch 3, dc in each dc around, making (3 dc, ch 3, 3 dc )in each corner sp. Join, fasten off and weave in ends. This one is so simple but very effective, especially with the new variegated yarns. It’s my new favorite stitch! You get neat squares of color instead of stripes or blocks. The stitch is also very cushy and would make a wonderful baby afghan. I’ve made you a square as an example. You will find it fun to work and fun to look at! Twin Hdc: Multiple of 2, plus 1. Chain length required, 2 hdc in the 3rd ch from the hook, (skip one ch, 2 hdc in next ch) across, ending with 2 hdc in last chain. Ch 1, turn. Row 2: 2 hdc in first hdc( skip next hdc, 2 hdc in next hdc) across. Materials: Red Heart Super Saver 5 oz. skein: color is Cherry Chip. Small amount needed. Row 1: With I hook, ch 25, in 3rd ch from the hook, work 2 hdc, (skip next ch, 2 hdc in next ch) 11 times. Ch 1, turn. You should have 24 hdc or 12 twin stitches. Row 2: 2 hdc in first hdc, (skip next hdc, 2 hdc in next hdc) 11 times. You should have 24 hdc or 12 twin stitches. Rows 3-16: Rep row 2. After row 16, fasten off and weave in ends. Just in time the cooler fall weather, this vest can easily be completed in a week-end. Work it in a longer length and you'll have a slimming topper to wear over you skirts or jeans. Size worked is small. To change size, work the medium with first numbers in parenthesis and large with second numbers in parenthesis. INSTRUCTIONS: With K hook, ch 145 (169-193). Switch to J hook. Dc in the 6th chain from hook (counts as a dc and ch-2) *ch 2, skip 2 chains, dc in the next ch,* repeat between the *’s across row. Row 2: Ch 3, turn, work * 2 dc under ch-2 of row below, ch 1* repeat between the *’s across row. Ch 4 (turn). Row 3: Dc under ch-1 of row below, * ch 2, dc under ch-1 of row below,* repeat between the *’s across row. Repeat rows 2 & 3 for pattern. Work even until entire length measures 14 (14-14) inches, or desired length to underarm. FIRST FRONT: Work across 10 (13-15) patterns, working one front at a time. Decrease 1 mesh at front edge every other row 6 (7-7)times. Work even until there are 13 (15-15) rows. Fasten off. BACK: Omit 4 (4-5) patterns. Then work on 18(20-22) patterns. Work even for 13 (15-15) rows. Fasten off. SECOND FRONT: Omit 4 (4-5) patterns. Work matching the same as First Front. FINISHING: Sew shoulder, with right side of work facing you, and at underarm seam. 2 sc under ch-2 and sc in dc at front bottom, work 4 sc in corner stitch then work 2 sc in each mesh. Make sure to keep work flat. Work to armhole (beginning of shaping) work 2 sc in corner stitch and work even all around the neck, other side and lower edge, sl st to beginning of row and work another row of sc and fasten off. ARMHOLE: Work same as border holding in to fit armhole. TIE: With doubled yarn, making a chain approximately 20 inches. Attach at point where you want to tie you vest closed See picture for detail. 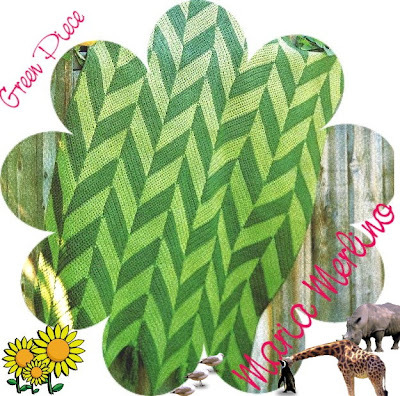 Let's remind ourselves to Keep It Green with this alternating zig and zag effect. Since you work one panel at a time, if you get bored with it, quit and call it a scarf! Row 1: With K hook and Hunter Green, ch 22. Switch to J hook, 2 sc in 2nd ch from hook, sc in each of next 20 ch, ch 1, turn. Row 2: Skip first sc, 1 sc in each of next 20, 2 sc in next st, ch 1, turn. Row 3: 2 sc in first sc, 1 sc in each of next 20, ch 1, turn. Repeat Rows 2 & 3 for pat, always having 22 sc on each row and working until 8 rows of Hunter have been completed, draw Frosty Green through last 2 loops of Hunter Green, sc on 8th row, ch 1, turn. Alternate 8 rows of Frosty Green and Hunter Green until the 8th Hunter Green stripe has been completed. Fasten off. Row 1: With K hook and Frosty Green, ch 23, switch to J hook, sc in 3rd ch from hook, sc in each of next 19 ch, 2 sc in last ch, ch 2, turn. Row 2: 2 sc in first sc, sc in each of next 20 sc, ch 1, turn. Row 3: Skip first sc, sc in each of next 20, 2 sc in last sc, ch 2, turn. Repeat Rows 2 & 3 for pattern, working until 8 rows of Frosty Green have been completed, drawing Hunter Green through last 2 loops of last sc on 8th row, ch 2, turn. Alternating 8 rows of Hunter Green and Frosty Green, work until 8th Frosty Green stripe has been completed. Fasten off. Make 3 more strips. With a "first" strip at each side, sew strips tog, alternating as shown. With Hunter Green on right side crochet 1 row of sc on each side edge. Fringe: Cut 80 strands of Dark and 40 Light each 13 inches long. Fold 5 Light in half and draw through each joining between points then knot 1 Dark fringe at each side of Light fringe as shown. Fringe other side the same. Red Heart Super Saver's newest printed yarn color is a luscious Lipstick red! The variances of red mono chromatics in the yarn makes this one of the richest hues I've seen in a long time. I also enjoyed the vintage-y feel the yarn gives off when worked up into a project. I'm sure your creativity will take over once you see this dramatic yarn for yourself. Get it while you can. The pattern for the flower pictured is a variation of the rose in the Yarn Rose Doily. I used a small hook for the center and a larger hook for the petals to give them fullness and depth. Rnd 2: sl st in next loop, ch 1, (sc, 6 dc, sc) in same lp, * (sc, 6 dc, sc) in next loop, repeat from * 4 more times, join. Fasten off. 37 Year Old Rectangle Granny Afghan Pattern Unearthed!!! It only cost 50 cents in 1975 to buy a Rectangle Granny Afghan pattern made in the typical colors of that era! I’ve recreated the pattern for you with modern day crochet terminology and substitute yarn. Hook sizes: I/5.5mm and H/5.0mm crochet hook (Canadian size 5 or 6) or size needed for gauge. Gauge: With H hook, rectangle should measure approximately 5" x 151/2" after 4th round is worked (the second orange round). Notes: Color sequence is * Pumpkin, Bright Yellow, Spring Green, Paddy Green; repeat from * for sequence. When working 2 or more rounds of the same color in succession, at the end of the first round, join by working a sl st in the ch-3 of the preceding round, but do not cut yarn,. Sl st across the tops of the next 2 dc, sl st in the corner sp. This will bring you in correct position to start the next round. As you reach each corner space, check back to see that you have made no errors on the preceding side. When you get into a rhythm, it's easy to make a mistake such as working only 2 double crochets in a space, or not making a corner properly. You could probably get away with the 2 dc mistake, but there is no nice way of fudging a corner edging. As the afghan grows, ripping back a whole side to correct an error is a big waste of time! So check as you go. It's also easier to stop and weave in your yarn ends every few rounds, so you don't have to do it all at one time when you are finished. Row 1: This is the foundation center row With I hook and Pumpkin, chain 48. dc in 4th chain from hook, switch to H hook, dc in each of next 2 chains, * ch 1, skip next ch, dc in each of next 3 chains. Repeat from * across, ending skip next ch, ch 1, hdc in last chain. Fasten off Pumpkin. Rnd 2: With right side facing, join Bright Yellow with a sl st in ch-1 space at end of previous row, ch 3, work 2 dc in same space (ch1, 3 dc) 3 times in same space; 3 dc in each space between groups to chain space at opposite end of Row 1, work (3 dc, ch 1) 4 times in end space, continue around working 3 dc in each space between groups. Join with a sl st, fasten off yellow. (3 dc, ch 1, 3 dc) all in next ch-1 space; 3 dc between each group along remaining side, join with a slip stitch to starting chain; fasten off spring green. * 3 dc between each group along side, (3 dc, ch 1, 3 dc) in ch-1 space of next corner; repeat from * 3 times, 3 dc between each group along last side, join with a slip stitch to starting chain. Fasten off paddy green. Then work 5 rounds in each of first 3 colors. Work 2 more rounds in Paddy Green to finish. At the end of round 60, fasten off. Fringe: Put one tassel in each corner space and in each space between groups along the two narrow ends for a total of 58 tassels on each side. For each tassel, you need 8 strands of Paddy Green, cut to 14" lengths. Hold all 8 strands together and fold in half. With crochet hook, and wrong side of afghan facing you, pull folded end through corner or space, pull loose ends through folded end, and pull knot up tightly. Fringe each space and each corner. The ripple stitch is a tried and true favorite. Since men despise “holey” stitches, working a ridged sc in a chevron pattern with 3 different manly colors, can please the most discriminating male in your life. To change color in sc: Draw up a lp in last st before color change, drop color in use, with next color to be used yo and draw through 2 lps on hook. To create a nice ridged effect, the sc stitches are worked in the back loop. Starting at Row 2, skip the first sc of the row and the last sc of the row. Always keep this in mind when working ripples, otherwise your edges will “grow”. Row 1: With I hook and Black, ch 220, switch to H hook, sc in 2nd ch from hook, and in each of next 6 ch, * 3 sc in next ch, sc in each of next 7 ch, skip 2 ch, sc in each of next 7 ch, repeat from * to last 8 ch, work 3 sc in next ch, sc in each of last 7 ch, ch 1, turn. Row 2: Skip the first sc, sc in back loop of each of next 7 sc, * 3 sc in back loop of next sc, sc in back loop of each of next 7 sc, skip 2 sc, sc in back loop of each of next 7 sc, repeat from * to last 9 sts, end with 3 sc in back loop of next sc, sc in back loop of each of next 7 sc, leaving last st unworked, ch 1, turn. Repeat Row 2 for pattern working 6 more rows with Black, work off last sc with Zebra, ch 1, turn. Repeat Row 2 working in stripes of 8 rows each of Colors Zebra, Red, Zebra and Black, always working off last sc with next color when changing colors. Work until there are 21 stripes in all. Fasten off. I just loved making this over-sized doily! I took a vintage pattern from my personal library and re-worked it for ease. It works up so fast, you'll be done, lickety-split! The re-written pattern instructions Copyright 2006 to me, Maria Merlino and is for personal use only. Materials: 4 ply, medium weight knitting worsted, such as Red Heart Super Saver, Caron, Bernat Berella 4. Cluster stitch= cl: There are variations of the cluster stitch but basically it means there is more than one stitch clustered together. As an example: If you were doing a 3 double crochet cluster you would do each double crochet without completing the last step (you would have 2 loops on the hook after the first dc, 3 loops on the hook after the second dc and 4 loops on the hook when all three dcs are completed. You then yarn over and draw through all of the loops. That is what clusters together the stitch. A beginning cluster uses the beg ch-3 as a dc. Rnd 2: Join red with a sl st in any lp, (sc, 5 dc, sc) in same lp, * (sc, 5 dc, sc) in next lp, repeat from * 4 times, join. Rnd 3: * Ch 5, sl st in back of work between next 2 petals, repeat from * 5 times, join. You will have 6 loops of ch-5. Rnd 4: Over each lp work (sc, 7 dc, sc), join. Rnd 5: * Ch 7, sl st in back of work between next 2 petals, repeat from * around. You will have 6 loops of ch-7. Rnd 6: Over each lp work (sc, 2 dc, 5 tr, 2 dc, sc), join and fasten off. Work 9 more roses in the same manner. Set aside. You will now make the center. Rnd 1: With white, ch 7, join with sl st in first ch to form a ring, ch 1, work 10 sc in ring, join. * 8 times, ch 3, join. Rnd 4: Sl st into lp, * ch 4, sc in next lp, repeat from * around ending with a ch 1, dc in same sp as beginning—this brings thread in po¬sition to begin next rnd. Rnd 5: Ch 3 (counts as first dc of cluster), cluster st in same sp, * ch 4, sc in next lp, ch 4, cluster st in next lp, repeat from * around end¬ing with ch 4, sc in next lp, ch 4, join in first cluster. Rnd 6: Sl st into lp, * ch 5, sc in next lp, repeat from * around. Rnd 7: Sl st into lp, ch 3, cluster st in same sp, * ch 5, 2 sc in next lp, ch 5, cluster st in next lp, repeat from * around, ending with ch 5, 2 sc in next lp, ch 5, join. Rnd 8: Sl st into lp, ch 1, 2 sc in same sp, * ch 7, 2 sc in next lp, repeat from * around, ending with ch 3, tr in first sc. Rnd 9: Ch 3, cluster st in same sp, ch 5, cluster st in same sp, * ch 1, 2 cluster sts with ch 5 between in next lp, repeat from* around, ch 1. Join; cut thread. Rnd 10: Join green in the ch 1 between cluster sts, ch 4, cluster st in next ch 5 lp, ch 1, sc in center st of any petal of rose, * ch 1, cluster st in same sp on center, ch 4, sc in ch 1 between next 2 cluster sts, ch 4, cluster st in next ch 5 lp, ch 1, sc in center st of next petal of same rose, ch 1, cluster st in same sp on center, ch 4, sc in next ch 1 lp be¬tween next 2 cluster sts, ch 4, cluster st in next ch 5 lp, ch 1, join to center st of any petal of next rose, repeat from * until all roses are joined, ending to correspond, join, fasten off. With green, ch 11, sc in sec¬ond st from hook, sc in each of the next 8 sts of ch, 3 sc in last st, working on other side of ch, sc in each of the next 8 sts. Row 2: Ch 2, turn, working through back lp of sts only, sk 1 sc, sc in each of next 8 sc, 3 sc in next sc, sc in each of next 8 sc. Row 3-7: Repeat row 2 five times. Next rnd: Ch 1, turn, join to cen¬ter st of second free petal on right hand side of any rose (to join: drop lp from hook, insert in petal, pick up lp and pull through), sk 1 sc on leaf and working through back lp of sts only, sc in each of next 9 sc, join to center st of next free petal of same rose, sc in same sp on leaf, join to center st of first free petal on left hand side of next rose, sc in same sp on leaf, sc in each of the next 8 sc, join to center st of next petal of same rose, ch 1, sc in next sc on leaf, fasten off. Work 9 more leaves joining between roses in same manner. 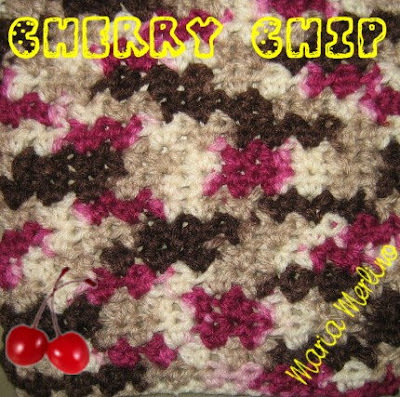 The Easy Learn To Crochet In Just One Day---My latest published patterns! 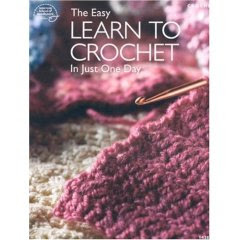 I'm so happy to let you know that The American School of Needlework's new book, The Easy Learn To Crochet In Just One Day is now available! This book is much more than an how-to on the techniques of crochet. The editor, Bobbie Matela, has put together a huge variety of patterns that even the most skilled of crocheters would would love to have in their stash. Some of the top designers---Darla Sims, Katherine Eng, Delsie Rhoads, Mary Ann Frits, Edie Eckman, Joyce Nordstrom, Maria Merlino, and many more have done their best to make these designs pop! Take for instance, Mary Ann Sipes " Let's Try Lace Scarf", with it's simple double crochet, and ch-1 stitch pattern, a beautiful diamond emerges across the length of the scarf. Mary Ann Frits took Grandma's tablecloth motif and joined 66 of them into a gorgeous sweater called Jazzy Diamonds. Carol Wilson Mansfield contributed two tapestry Botanica Pillows. If you've ever wanted to learn how to do the color change type of picture crochet, these are perfect. I also want to draw attention to designer's Svetlana Avrakh's Floral Cluster Skirt. What a show-stopper! This lacy garment is made with a 4 round repeat and light worsted weight wool. If you like felting or beading, there are projects for you from Zena Low and Nazanin S. Fard. 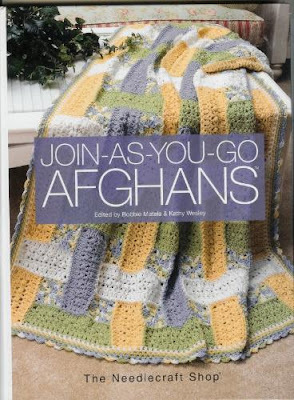 There are loads of patterns including those for afghans, wearables and decor. Even if my Colorful Table Set and Napkin Ring weren't in this book, I would still buy it.